UDM Downloads > Credit Card Manager! 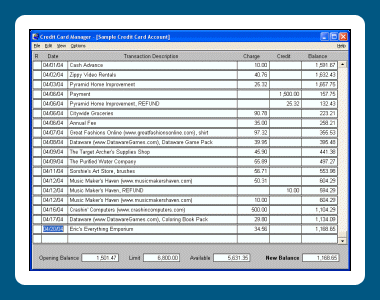 Credit Card Manager helps you manage your finances by keeping up with your credit card purchases and payments. By keeping track of your transactions, you will know if any unauthorized charges have been made to your account. You will also know exactly how close you are to your credit limit -- no more guess work. When your credit card statement arrives each month, Credit Card Manager will compare your entries with the statement to help you find the discrepancy, if any. In addition to many other features, Credit Card Manager stores your credit card account info so you will have it readily available in case your credit cards are lost or stolen. Checkbook also has the option of password protection. Published by Dataware.